Garlic is among the world’s oldest cultivated crops. It is valued for its culinary uses and is prized for its proven medicinal properties. Today, homeowners take to growing garlic in their gardens. They are quick to confess that home-grown, dried garlic is more flavorful than the already dried bulbs readily available from the grocery store. For a steady supply of garlic in their kitchen, cooking aficionados resort to drying and storing their garlic. There are several techniques of dehydrating whole bulbs of garlic. Garlic may also be broken into separate cloves, and then sliced prior to drying, or powdered after drying. Nevertheless, dehydrating garlic starts with good planting and harvesting methods. 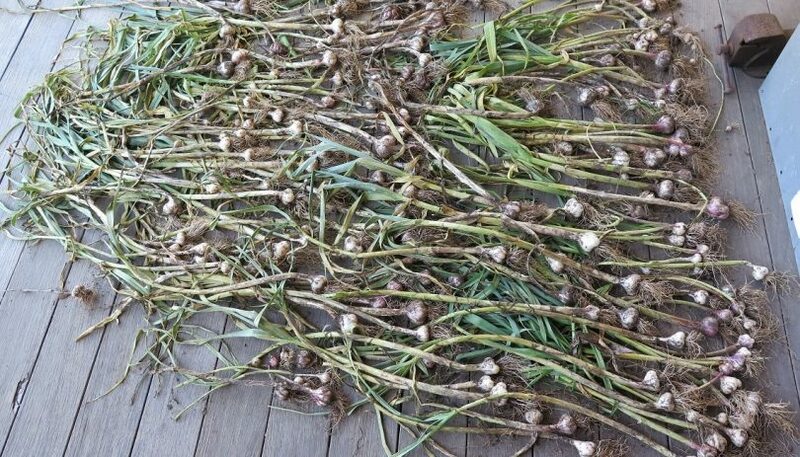 Grow varieties of garlic suited for drying and storage. Your best options are the Wight, Silverskin, Ivory, Elephant, Cristo, and Creole varieties. Harvest your garlic when the soil is dry. This means no watering for at least a week prior to harvesting. A warm day is a good time to harvest your garlic. Don’t remove the stalks, roots, and leaves. You should keep them intact during the entire curing time. Don’t wash the garlic plants after they are harvested. Moisture will encourage mold growth. If dirt is your problem, you may just peel off a few layers of skin off the bulbs. Here are easy methods of dehydrating garlic at home. Thoroughly drying garlic bulbs is necessary prior to storage because they are prone to sprouting. When exposed to high humidity or rain, the bulb stem starts to form seed-heads which cause it to soften, rot, and produce molds. Harvest your garlic when they have reached maturity. A reliable harvest indicator is when each half leaf has died off while the upper half is still green. The leaves start to die off from the bottom up. Choose a shaded, cool, well-ventilated place to cure your garlic. It should be no cooler than 50°F (10° C). Shaded locations are ideal places because of the steady stream of air. Arrange the garlic plants in a single layer. You may use horizontal racks or vertical nets that hang around the walls of the shed. You may also braid them in a bunch and hang them from the rafters. Wait for one to two months for the garlic to fully dry. By the second month, the leaves would have turned brown and the roots already stiff and shriveled. Trim the roots, leaving a ¼ inch from the base of the bulb. Cut as close as possible with one or two snips. Cut the leaves off leaving an inch from the top of the bulb. Do not remove skin and don’t cut too close for longer storage life. Keep your garlic cool and dry. Depending on the volume of your harvest, you may choose to place them in an outdoor shed or in your kitchen cupboard. What’s crucial is that you keep them away from direct sunlight. If high humidity is a persistent problem, you may use another method of drying garlic. Select the cloves that you intend to turn into minced dried garlic. Avoid using gloves that are visibly bruised. Peel your cloves. Discard the papery skin or use them for compost. For thin garlic slices, cut them crosswise using a razor-sharp knife. If you want them finely chopped, use a blender. Either way, make sure that you cut off the root end of the cloves first. If you wish to dry it in the oven, arrange the garlic on a baking sheet lined with parchment paper. Preheat the oven to 170°F (or to the lowest setting your oven can heat to) and bake for at least 30 minutes. Check on your garlic once in a while and stir the bits to ensure that they are drying out evenly. After 30 minutes, remove the sheet from the oven and let cool. You’ll know that your garlic is completely dried when pieces break, snap, and crumble easily in your hand. You may choose to use a dehydrator. Set it at the maximum 115°F setting (45°C). If your dehydrator has holes in the racks, make your garlic slices larger. Dry your garlic for up to 48 hours. Higher temperature settings would require less drying time. If you want them crispy, aim for 2 days of drying at 115°F. Anything less than that would turn your garlic chewy. Place the dried sliced or minced garlic in an airtight container, then store in your freezer. Your garlic will have a shelf-life of one year. To use in your food preparations, grind an amount you need using a mortar-and-pestle or a coffee grinder. You may also store dried garlic in a mason jar in your kitchen at room temperature. As long as you keep it away from high heat sources or direct sunlight, it should last for several months. Turn your garlic pieces into garlic powder, which is good for adding savory flavor to any dish from pasta to pizza. Immediately after they have cooled, grind the pieces using a coffee grinder. Then using a fine sieve, sift the ground garlic to separate the fine powder from the remaining bigger pieces. Your garlic powder should last for 2 months. You may also try combining your garlic powder with onion powder, red pepper flakes, and chili powder to concoct a unique seasoning. Braiding garlic is a tidy way to store your garlic. Not only does it make for rustic kitchen décor, but it also comes in handy whenever you want a clove fast. Braiding can be a little daunting at first, but as soon as you learn the basics, you’d realize that it’s fun. It takes up to nine months for your homegrown garlic to finish growing and ripen for digging. Of course, you’d want that garlicky flavor on your food the whole time until your next batch is ready for harvesting. This is why curing your garlic proves worthwhile. Reading through the methods of dehydrating garlic, you must have realized that the steps are as easy as pie. Now, you are assured of a steady supply of flavorful garlic throughout the whole year.